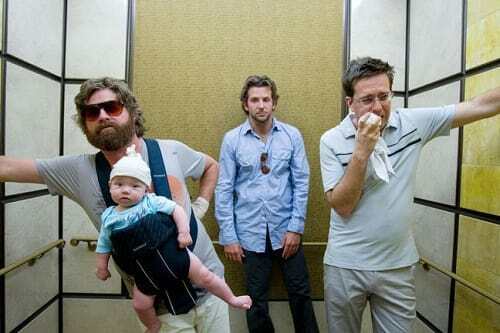 The cast of The Hangover waits for more hilarity. Zach Galifiankis is the one most charged with the babysitting duties in The Hangover. Doug: I always wondered why they were called roofies. Cause you're more likely to end up on the floor than the roof. They should call em groundies. Alan Garner: Hello. How 'bout that ride in? I guess that's why they call it Sin City. Alan Garner: You guys might not know this, but I consider myself a bit of a loner. I tend to think of myself as a one-man wolf pack. But when my sister brought Doug home, I knew he was one of my own. And my wolf pack... it grew by one. So there... there were two of us in the wolf pack... I was alone first in the pack, and then Doug joined in later. And six months ago, when Doug introduced me to you guys, I thought, "Wait a second, could it be?" And now I know for sure, I just added two more guys to my wolf pack. Four of us wolves, running around the desert together, in Las Vegas, looking for strippers and cocaine. So tonight, I make a toast!